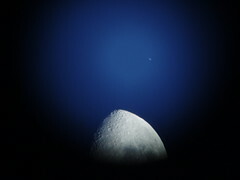 This is an old photo I took of Saturn next to the moon, right at the moment of sunrise, give or take seconds. Check out the larger sizes for the rings. The timing of the photo (at sunrise) was an accident since I was photographing something else before the sun came up. I had no idea that Saturn was up there, next to the Moon. The date was December 10, 2006. I took it from Greenpoint, Brooklyn.